One trend you will be sure to see this fall will be embellished collars. This trend is a great way to incorporate your individual style. 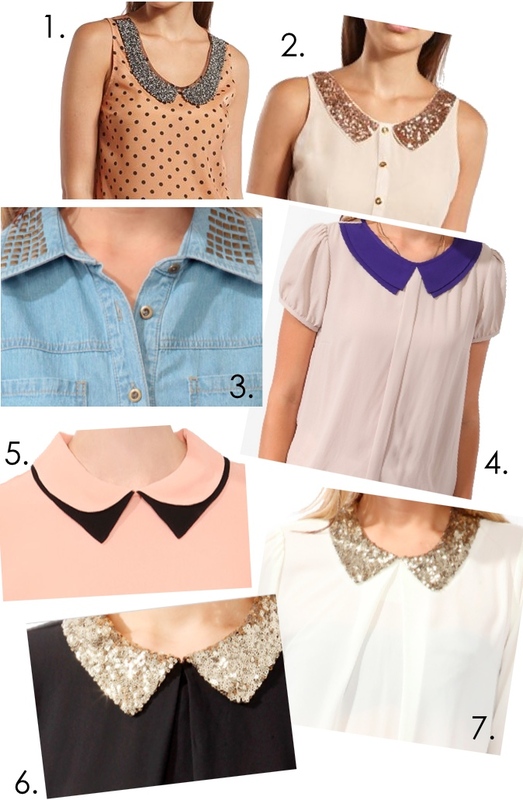 Collars can be studded with sequins, studs, or even mental tip and that just the tip of the iceberg! Also there no need worry about accessories as the embellished collar will serve as your necklace. You can pair the embellished collar blouse with jeans, pleated skirts, even blazers will give you a chic look when styling this top. Ms. Vanessa Simmons debuted her Rose by Vanessa Simmons (Swim Suit) line recently in Miami. If you remember a couple of months ago, I blogged about her line. Let me preface this by saying that I was excited about the line she was creating. I was speaking with my second mom(s/o to GiGi) about it and we both were excited to see what she had to offer. So now that it clear that I’m not trying to throw any shade… I was unimpressed. The line look unfinished and just thrown together. It looked like something that a young girl would create in her bedroom as a D.I.Y project. The darker items weren’t bad but the collection as a whole lacked cohesion. I’m hoping that better tailored pieces will follow for lingerie. Sorry Vanessa!…. You loooked stunning tho!! Video Vixen turned actress returned to the video screen in Rick Ross Touch’n You video. We received an email asking what bathing suit Tae was wearing in the video. After a lot of research I’ve found it! The curvacious woman was wear MARC BY MARC JACOBS Havana Floral Cutout Maillot one piece. The suit comes in two colors…and Retails at 119.00. Purchase the suite here! Ali Fedotowsky looks ready for summer in this chambray shirt paired with striped shorts and Steve Madden crochet wedges. I also love the idea of recreating this look for the 4th of July. A unique twist to the mundane wedge is perfectly exhibited here by the ultimate heel mastermind, Giuseppe Zanotti, of course. Containing all of the staple Zanotti features such as a) a very high heel, b) signature wedge style, and c) glamour in every shape and form! What I love about this shoe is the versatility and ability to style these for day or evening wear. For instance, Kim K. looks absolutely fantastic in these wedges. Whether she wears them with a casual pair of distressed jeans or flowy dresses she looks very polished and chic. Though the must-haves are sold out, fear not because we found an identical pair to match these! Below or some similar options for you for a little less! One of my summer must-haves is definitely a fedora. I love hats, and want to incorporate them more in my wardrobe. For an instant summer look, pair yours with a summer dress or jean shorts for a barbecue with friends. They can also help cover up a bad hair day. For this weeks Style Fresh we have Leanna Sarah from Boston. She’s an Aries which contributes to her personality: She’s opinionated and easy going. I have a pair of suede platform wedges and they are beyond comfortable and and beyond cute! These Giuseppes come in both open and close toe and are perfect for any outfit! Check out some of todays celebs below rockin ‘em. Click read more for shoes inspired by Giuseppe Zanotti for a fraction of the price!